Companies have been implementing open-plan offices since the 1960s and it is estimated that some 70% of workplaces today are of the open-plan variety. The urge towards open-plan offices is driven by a proclivity to cut costs and fit more employees into less space. Although there is a case to be made that it improves collaboration, there is more than enough evidence to support the fact that open-plan offices are not quite the boon everybody think they are. One of the chief reasons to believe that open-plan offices should be reconsidered is that they impinge on our privacy. And believe it or not, they stunt our intra-office interaction and communication – rather than enhance it. A study conducted by two Harvard researchers and published by The Royal Society found that workers in open-plan offices spend a whopping 73% less time in face-to-face interactions, whilst email and messaging increased by over 67%. The study was done before and after a major office restructuring at two Fortune 500 companies and measured more than 100 000 face-to-face conversations. This inevitably leads to lower productivity – which runs counter to what should be achieved with open-plan offices. Not all work is done collaboratively and some work requires uninterrupted focus. Geoffrey James, contributing editor at Inc.com, points to an Exeter University study that showed open-plan offices create a 32% drop in employee wellbeing and a 15% decrease in productivity. Moreover, he says, workers lose on average 86 minutes per day due to distractions associated with open-plan offices. This will seriously encroach on their work performance and cause them to be selfish – a fact borne out by the findings on decreased interaction. This is corroborated by another study of 10 000 workers funded by office furniture giant Steelcase. In this, 95% of the respondents said working privately was important to them, yet only 41% said they were able to, and 31% had to leave the office to get work completed. “When distraction makes it hard for employees to focus, cognitive and emotional resources are depleted. The result is increasing stress and errors, undermining performance,” says Sander. James writes on LinkedIn that although it is undeniable that open-plan set-ups reduce the need for space and subsequently lower what employers pay for office space in rent, their net effect is what should be measured. For instance, he notes that employees in open-plan offices take over 60% more sick leave than those in private offices. “The outcome of working in an open-plan office was seen as negative, without offices causing high levels of stress, conflict, high blood pressure and a high staff turnover,” says Vinesh Oommen from the Queensland University of Technology’s Institute of Health and Biomedical Innovation who led a study on open-plan offices. Those symptoms occurred in as many as 90% of the employees surveyed. Germs and viruses also spread more easily in open-plan offices (which has fewer or no physical barriers), especially during winter-time. Ethan Bernstein and Stephen Turban, 2 July 2018, “The impact of the ‘open’ workspace on human collaboration”, https://royalsocietypublishing.org/doi/full/10.1098/rstb.2017.0239. Geoffrey James, 16 February 2016, “Open Office Plans Are a Lot Less Cost-Effective Than You May Think”, https://business.linkedin.com/talent-solutions/blog/hr/2016/open-office-plans-are-a-lot-less-cost-effective-than-you-may-think. Julia Griffin and Nsikan Akpan, 27 July 2018, “Here’s proof that open office layouts don’t work, and how to fix them”, https://www.pbs.org/newshour/science/heres-proof-that-open-office-layouts-dont-work-and-how-to-fix-them. Libby Sander, n.d., “A new study should be the final nail for open-plan offices”, https://theconversation.com/a-new-study-should-be-the-final-nail-for-open-plan-offices-99756. 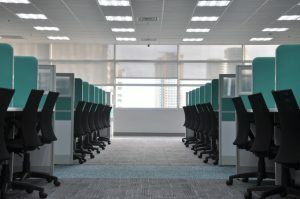 Shane Borer, 3 June 2009, “Are open-plan office bad for work?”, http://www.cfodailynews.com/are-open-plan-offices-bad-for-work/.